Meeting dinner guests at your house at the same time you are coming home from work... Boy you don't feel like cooking. So glad you threw all the ingredients for Slow Cooker Mediterranean Chicken with Sun Dried Tomatoes in the crockpot before you left for work this morning. Yes, a tasty meal of chicken, sun dried tomatoes, artichokes, and potatoes in a white wine sauce is there to greet you and your guests. Who says you can't have a dinner party during the work week? 1) Put potatoes in the microwave on high for 5 minutes before putting them in the bottom of the slow cooker. 2) layer the onions on top of the potatoes followed by the chicken lightly salt and pepper each layer. 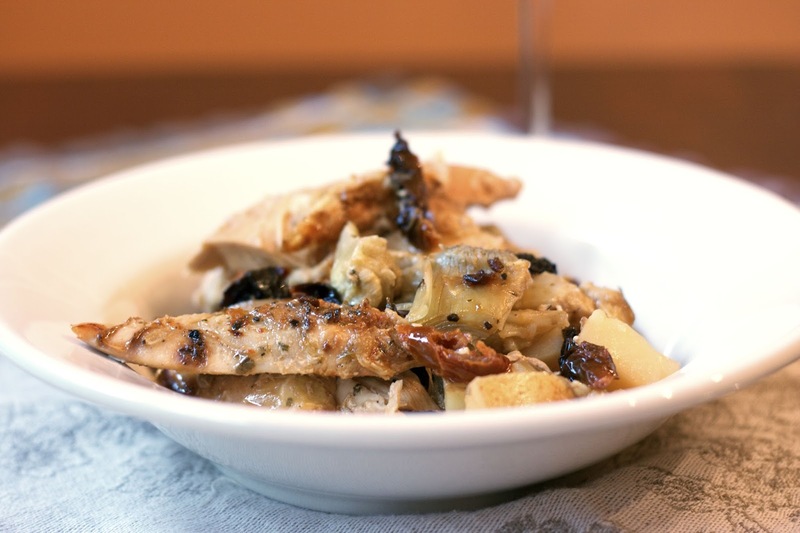 3) Pour wine, artichokes, and sun dried tomatoes over the chicken. Cover the chicken with these ingredients. 4) Cook on low for 4 to 6 hours. The hubby and I usually make all our food for the week on the weekends and then reheat portions for each night. This is looks like a great alternative. That's a lot of cooking but very practical. It kept you from eating fast food. So good to hear from you Annamaria. This dish sounds delicious, Diane! I like to entertain during the week but am always looking for recipes to make it easier. This is definitely one to add to my collection! Sharing. Thank you so much for bringing your Slow Cooker Mediterranean Chicken with Sun Dried Tomatoes to the Hearth and Soul Hop! 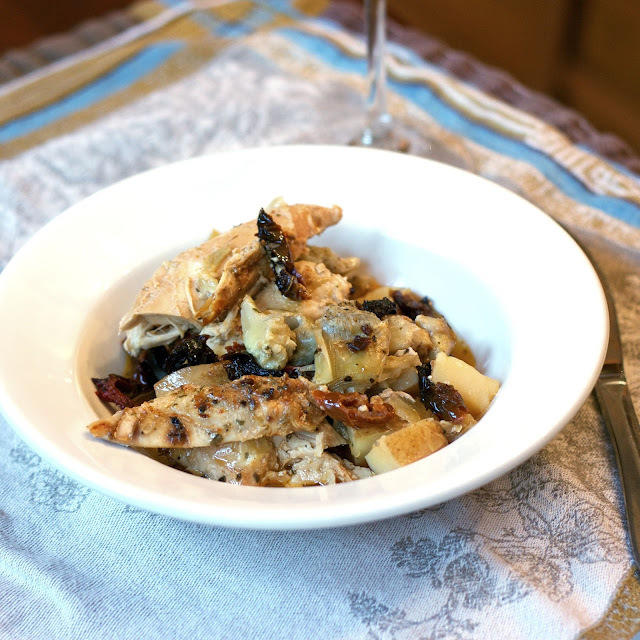 Your Slow Cooker Mediterranean Chicken looks fantastic! Wishing you and your family a bountiful Thanksgiving and thanks so much for sharing with Full Plate Thursday.